Since launching in September alongside the iPhone 6s and 6s Plus, iOS 9 has seen its adoption rate grow to 66 percent of active iOS devices, according to numbers on the Apple Developer Support page. Two weeks ago, iOS 9 adoption sat at 61 percent. 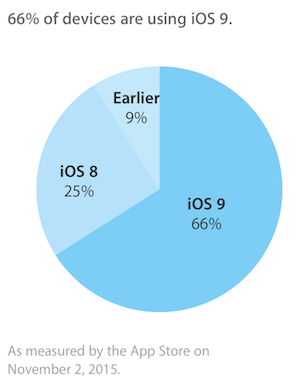 After 24 hours, iOS 9 adoption was in line with the adoption rate of iOS 8. However, in late September Apple announced that the newest version of iOS had the fastest adoption ever and was on pace to be downloaded by more users than any other version of the mobile operating system. iOS 8 only achieved a 64 percent adoption rate by December 23 and a 68 percent adoption rate by January 7, ending up with a high of 87 percent on the eve of iOS 9's launch. Apple released the first major update to iOS 9 two weeks ago with iOS 9.1, which featured a slew of brand-new emojis. Since that update, iOS 9 adoption has grown by 5 percent. Earlier today Apple seeded the second beta for iOS 9.2, the second major update to its newest mobile operating system. Correlation does not equal causation. This article implies that the increased adoption was caused by the availability of emojis. Not because of emoji - because 9.0 was a train wreck. The emojis? C'mon you can write better headlines than that. Out of curiosity, which iPad? iPad 2, the tablet they sold for years for only "$400" because people loved buying it still. Pretty impressive results from the lockout. Yes, you know, the one where if you want to try the newer OS, shortly thereafter they stop allowing us to downgrade back to WHAT WE PAID FOR! You're not buying the OS, you're licensing it. So what you paid for was the hardware. Why don't they be honest! The 9.1 update was the only reason I updated. Emojis had nothing to do with it, which I couldn't care less about. And to draw a correlation between the percentage who since updated to 9.1 and that it also included an updated library of emojis is clutching at straws. Emojis? Really? 5% of people only care about EMJOIS?! I'll occasionally get a personal text that has emoji things in it. I find it ok coming from younger family members but anything more than a smiley face from an adult seems juvenile. You're not buying the OS, you're licensing it. So you what you paid for was the hardware. OK, OK, I'll cool my jets over what is nothing more than Apples usual marketing tactics.